Are you planning a long trip but are not sure which kind of travel insurance plan is best for you? We receive a lot of questions about insuring long trips, so we compiled a list to make it easier for you. If you still have questions about coverage for long (or short) trips, you can call our highly-rated customer service team at 800-699-3845. What is long stay travel insurance? When you plan on taking one long trip, it is important to know the maximum trip length your travel insurance policy will cover. Under the Arch RoamRight Essential, Preferred, and Elite plans, the maximum covered trip length is 180 days. A trip is defined as the first date you leave your primary place of residence until the date you return to that primary residence or your permanent location. A trip is not defined by the destination. For example, if you are planning a trip in which you leave your primary residence of New York and will visit France for 30 days followed by Amsterdam for another 30 days before returning to New York that is defined as one, 60-day long trip under your travel insurance policy. What is included in long stay travel insurance? As long as your trip length does not exceed the 180-day maximum trip length of the Essential, Preferred, and Elite travel insurance plans, your available coverage for a longer trip is the same as for shorter trips. These plans include coverage for Trip Cancellation, Trip Interruption, Trip Delay, Lost/Stolen/Delayed Luggage, as well as emergency medical benefits, and more. For full details of coverage and benefit limits, you should review the policy documents prior to purchase. Our handy travel insurance plan comparison page can help you compare the coverages and benefit limits among all three plans. Should you get single-trip or annual travel insurance? 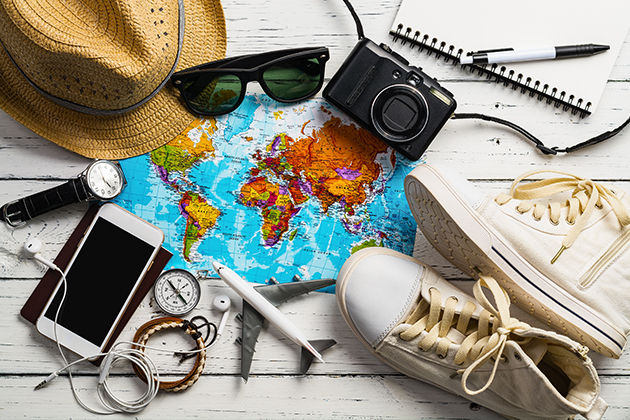 Travelers who are planning a long trip or are planning multiple trips in a single year often are unsure if they should get a single-trip travel insurance plan or if a Multi-Trip annual travel insurance plan is better. If you are taking a single, long trip that is 180 days in length or shorter, you should focus on the single trip plans such as the Arch RoamRight Essential, Preferred, or Elite. The reason why the Multi-Trip plan will not work for you is because the maximum trip length for that plan is 30 days. For any trips exceeding that length, you will have to buy an additional single-trip policy in order to have coverage. This is where the Multi-Trip plan is ideal. If you take multiple shorter trips – 30 days or less each – in a year, you should consider the Arch RoamRight Multi-Trip plan. Since Arch RoamRight’s single-trip plans have a maximum trip length of 180 days, we are unable to insure a trip that is a year or longer in length. If you are going to be staying outside of the United States for longer than 180 days at a time, you should look into expatriate insurance. Arch RoamRight does not offer expatriate insurance. Whether you should add additional coverage depends on your personal travel needs. With the Essential, Preferred, and Elite plans, there are optional upgrades that are offered that you may need while you are on your trip. These include coverage for Hazardous Sports, increased benefit limits for certain medical coverages, and more. Does it cost more to insure a long trip? Yes, since Arch RoamRight plans are priced partly by length of trip, you will likely find insurance for a trip 90 days in length will cost more than a trip that is 30 days in length. Is the Pre-Existing Conditions Exclusion waiver available for long trips? Even for longer trips, you can receive the Pre-Existing Conditions Exclusion waiver if you meet all criteria for qualification. Is there an age limit for coverage under Arch RoamRight for longer trips? No, there is no age limit under Arch RoamRight policies for long or short trips.